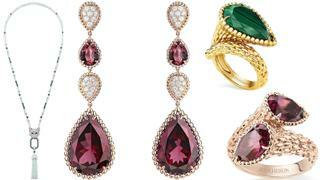 A selection of modern Boucheron jewels which will be on display. To celebrate its 160th anniversary French fine jewellery house Boucheron will be hosting a new exhibition, Vendôrama. Held in a temporary structure at the Monnaie de Paris, where Boucheron will be sponsoring the restoration of the Jardin Mansart in 2018, the immersive exhibition is conceived in distinct stages taking visitors on a journey through both the house’s history and its jewellery making practices. Greeted by actors who will share anecdotes about the maison throughout the exhibition, guests are first invited to discover the inspiration behind some of Boucheron’s most famous jewels. Featuring pieces from the house's extensive Place Vendôme archive, this phase tells the story of how Frédéric Boucheron came to be the first jeweller on the famous square and how each previous generation has taken inspiration from his designs. The exhibition also recreates the Salon Chinois – the red-lacquered library at the heart of the Boucheron boutique that allowed VIP clients to exit unseen through a hidden door. Next visitors will be immersed in the design and manufacture of Boucheron’s jewels. Featuring hundreds of pieces of artwork by its in-house designers, this is the first time Boucheron has allowed these to be seen by the public and illustrate how the house puts its huge collections of precious stones centre stage in every design. Using the exhibition’s dedicated app, visitors can even ‘paint’ their own colours on to a sketch of the signature Question Mark necklace which was originally designed in 1879. This space will also trace the history of Boucheron’s highly skilled craftsmen, who each personally signed their finished pieces until the 1980s. Finally guests will see Boucheron’s modern collections – the Quatre and Reflet – in all their glory as part of a phase celebrating the revelation of a finished high jewel. 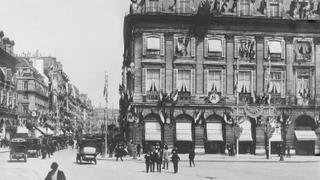 Also on display will be vintage Boucheron advertisements and visitors will be offered the chance to create their own short 360-degree videos filmed in a recreation of the Place Vendôme. Vendôrama will be on at the Monnaie de Paris from January 12 – 28, 2018. 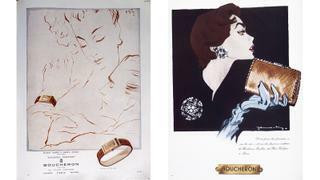 Visit vendorama.boucheron.com for more information.